by Dave from The Longest Way Home ~ August 16th, 2017. Updated on July 26th, 2018. Published in: Travel blog » Nepal. Whatever happened to Freak Street? What a name to call a place! “Freak Street”. It’s actual name is Jhhonchen Tole and it sits to the south of and adjacent to Kathmandu Durbar Square. I once disregarded it, now it’s one of my favorite spots in Kathmandu. The name “Freak Street” was given to it by locals during the 1960s due to the amount of “strange” hippies that would congregate along the streets popular hashish cafes. This was when marijuana was legal in Nepal and hippies were among the first tourist trends in the country. In the 1970s under pressure from the USA government hashish was banned and Freak Streets economy collapsed. 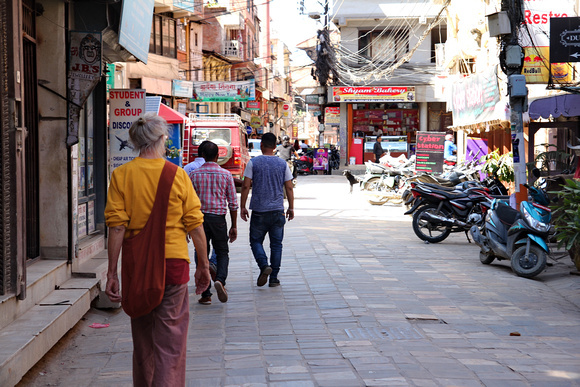 Trekking tourists were now en vogue and they preferred to stay in the slightly more commercial zone known as Thamel. While many tour guides and locals dismiss Freak Street as not being of interest, I disagree. Over the past few years I’ve watched Freak Street bounce back a little. Indeed, with insane rent increases changing Thamel, Freak street may once again hold the key of hope for many budget travelers in Nepal. No more hippies! 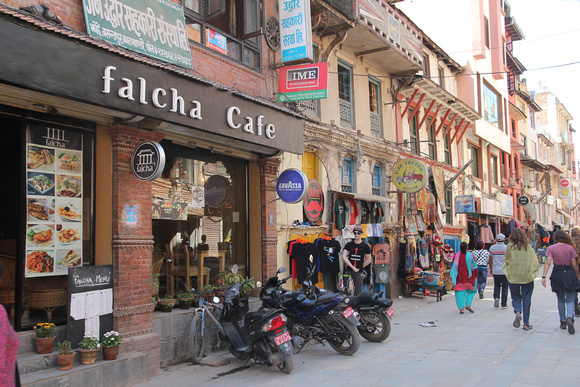 Today Freak street is filled with “trendy” Nepali in coffee stores! For those looking for a specific travel guide to Jhhonchen Tole then do check out my guide to Freak Street. Otherwise, let’s take a quick look at “Freak Street” as it is today! Let’s not get too excited. Keep your expectations low and look for hints of the past to truly appreciate Freak Street. It only takes 5 minutes to walk down the once infamous street. Immediately leaving Kathmandu Durbar Square you’ll be walking on the smooth stone slabs that cover Freak Street. Traditional Newar pavement rather than bland modern tar-macadam. Any official signpost will mention Jhhonchen and not Freak Street, but look at the shop signs! To the right you’ll see a “colored pipe” store next to a chip shop. Hookas and Shisha pipes are technically illegal in Nepal. Colored pipes are not! It’s the only one that gives a reference to when Freak Street was known for something else. 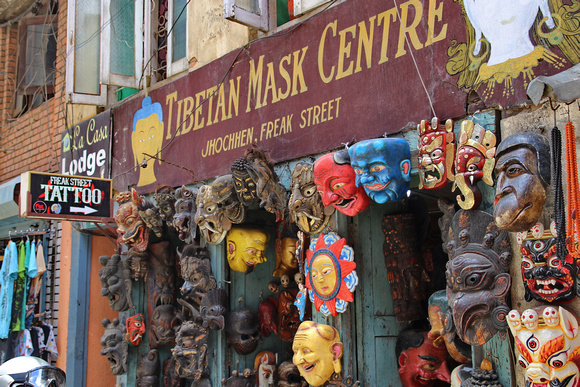 Tibetan Mask Center is a blast from the past! To the left is Himalayan map house where you can buy great trekking maps and guidebooks, including my own guidebook to Nepal. A little further to the left and you’ll come across the Tibetan Mask Center. One of the last remaining wood carved face-mask shops in Kathmandu. Right beside it is the last second hand bookstore in Freak Street. 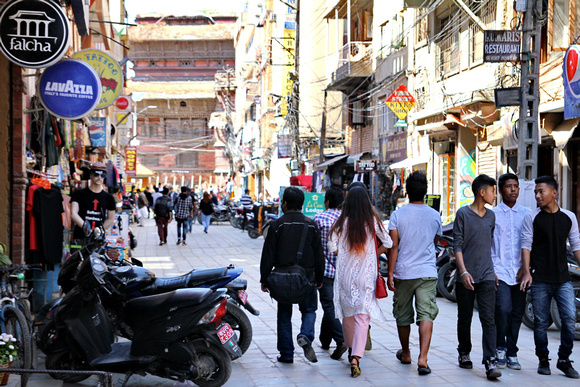 Freak Street is a “place of lasts and firsts” in Kathmandu. Indeed, that’s it’s charm. The same charm that the commercial tour companies can’t fathom as being attractive. To the right is a wonderful carpet, pashmina and local clothes store. Still using the old method of simply displaying their materials to attract customers rather than have a shop name. Another charming feature of old Kathmandu. The first junction has a hidden gem to the left along a side street. The Snowman cafe has been serving up cakes, milkshakes and juices here since the 1960s. Stepping inside is like going back in time. It’s a wonderful experience and worth the short walk alone to rest up a little. Dare I say, it’s worth coming to Freak Street alone for a taste of the Snowman’s cakes! Further along this street you’ll come to local Naan stores, Chat (sweet stores) and more. All local and all worth it if you have a good stomach! Back on the main strip of Freak street and you’ll notice a lot of new coffee shops opening up. Some good, some just okay. The sandwich shop by the Buddhist Chaitya now entertains trendy Nepali on mobiles instead of hippies. But around the corner from it are a few tye-dye hangout places. A little further past the Bhairab shrine to the left and there’s another junction. Just past the junction is Eden Hotel. Fully renovated in 2017, its history is alluring. It was the first and last of the Hashish houses. Known back then as Eden Hashish House. It stayed open as a hotel and was indeed the first hotel in Kathmandu to have an elevator installed. It’s all changed now with a new shop front and renovated rooms. 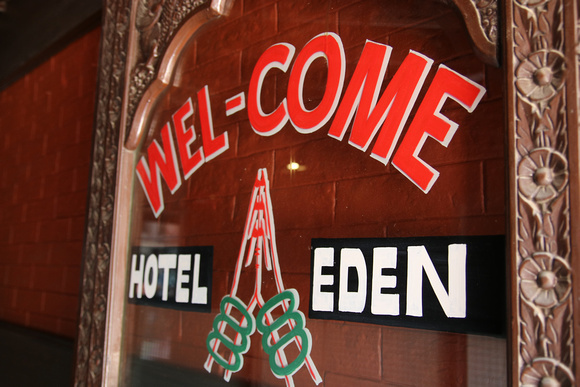 Hotel Eden in Freak street where there used to be a “hash” shop. Today it’s a freshly renovated hotel … that’s a bit different! To the right leads you on to the old monastic heritage zone. To left, new Kathmandu and one of my heritage walks found in my guidebook. Straight ahead we technically walk out of Freak Street. But there’s one last treat worth taking a look at ahead. Keep walking and you might just find a tall wall mural of a Lakhey dancing that stretches up 5 floors. The Lakhey is a Newari demon in folklore that protects the local people and in specific children. It’s an amazing and beautiful piece of street art. I’m not sure how long it will be there for as it seems like there’s a construction site beside it. The amazing Lakhey mural at the end of Freak Street along with a “secret” space invader! The story of the Lakhey mural here is quite poignant. The man who portrays the Lakhey, Laxman Ranjit, was with his wife Nilu giving blood when the earthquake of 2015 struck. He rushed out to protect his son but sadly his wife did not make it. An artist, Martin Travers, created this mural as a memorial of sorts to the Lakhey and his wife who can be seen depicted in the mural under the moon. Right beside the mural is another part of hidden secrets in the city. 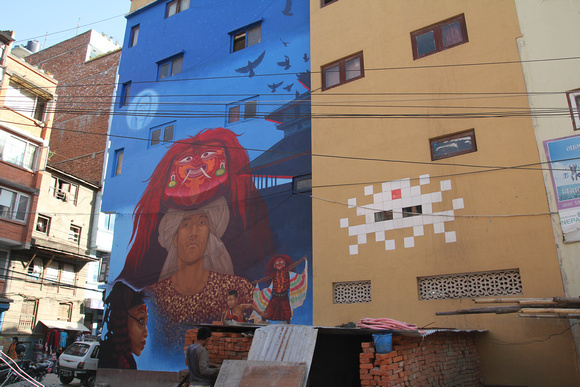 A giant space invader in Kathmandu. Today local’s scoff at me when I say that I’m going to Freak Street. “There’s nothing there!” they say. I don’t answer back. I just smile. Walking down along Freak street I take in the “old Kathmandu charm”. People still greet me out of friendliness with no inclination to sell a souvenir or knock me over with a motorbike. I can step into the bustling Snowman Cafe which is usually filled with young Nepali people and the odd knowing tourist seeking out the best cakes in Nepal. 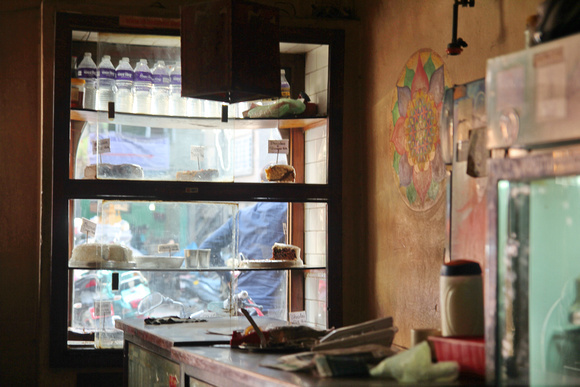 Freak street boasts some excellent new Kathmandu restaurants that many people have yet to discover. Do read by free guide to Freak Street or get my Nepal guidebook for maps, reviews and so much more! There are trendy new coffee shops where I can sit and enjoy watching the odd returning old hippie taking in memories of yesteryear. I laugh at the irony of both hippies and myself enjoying a part of Kathmandu. In Freak Street I can get my lunch at a reasonable price that’s not inflated for “tourists”. My barber is here, my curd store is here (next to Hotel Eden), there’s a treasure trove of heritage off the side streets (listed in my Nepal guidebook). It’s more than just a street. It’s the Kathmandu of old. 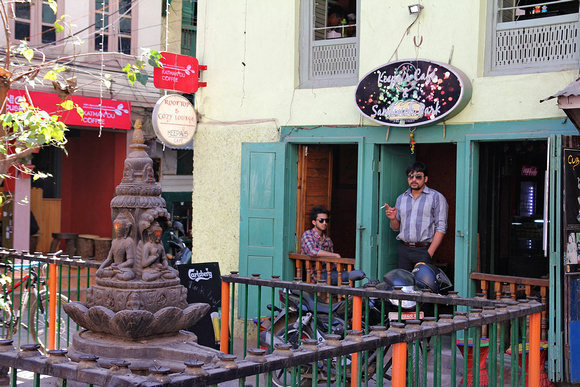 Freak Street retains a charm that Thamel has lost in recent years. Most tourists don’t see the charming nature of Freak Street. Perhaps they only see the Kathmandu of today. In this case I say, take a break from your Kathmandu Durbar Square tour and have a quiet lunch in one of Freak Streets new restaurants. Then go back to the hustle and bustle of modern day Kathmandu if you want. To everyone else who knows Kathmandu of old I say: enjoy this last old tourist street that’s still known as Freak Street. Maybe you visited here years ago and thought nothing of it. 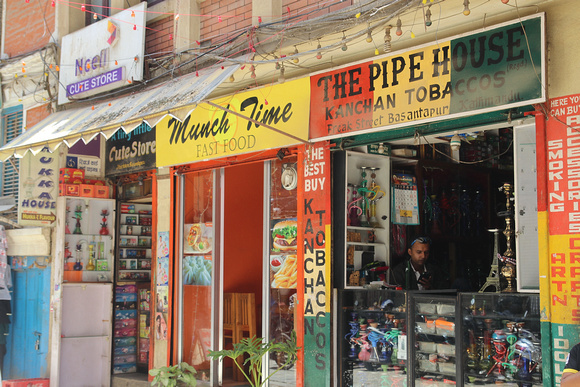 Now, on your return to the ever changing city known as Kathmandu, visit Freak Street and discover what you might just have been missing out on! For newcomers, this is simply what Kathmandu used to look and be like before the commercial bustle. Find out more about places like this with the most up-to-date, popular and dedicated guidebook to Nepal in the world. Over 550 pages & 900+ photographs of every temple listed, every day on all the treks lists and so much more. Finally a little common sense. I was reading about “freak street” somewhere else and got a totally different impression. Great to get a look at it like this. No problem, I like to keep it correct here! I know it’s heritage because of its 60s history. But does freak street date back any further culturally? Yes indeed. 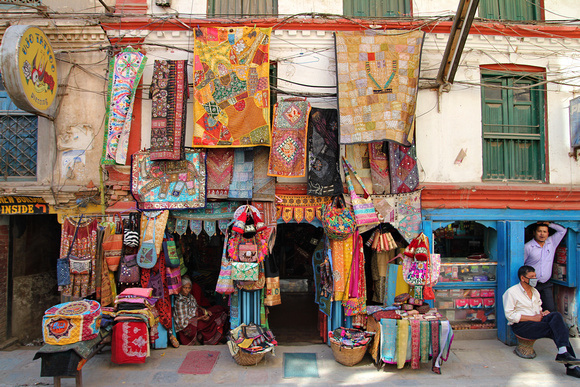 Freak street dates back to the very start of Kathmandu when it was just two trading villages. They then formed Kasamandap . As an old Newari township it would put Freak Street at over 1000 years old with ease. Great that such a place still exists. I hope they learn that sometimes it’s okay not to change a place! What a great find! It’s so interesting to find places like this that are stuck in a sort of time vortex. Great perspectives. There’s something even closer to being stuck in time next week. Can you still get a smoke here. Great insight as always David. Nice look at how things used to be. I hope it stays that way. Visiting Freak Street in Kathmandu seems like a tranquil experience for all.Thank you!! It is tranquil, when there’s no traffic.